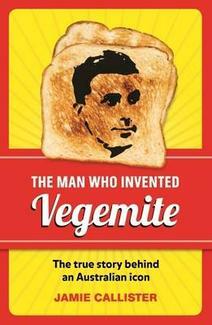 The Man Who Invented Vegemite is the story about Cyril Callister, the man behind the story of Vegemite. Vegemite is perhaps Australia's most enduring cultural icon. But how did this pungent, salty black paste, which for most of us is how we start the day, come to be created? Cyril Callister was a passionate scientist and innovator, and his story is inextricably bound with that of our country through the first half of the twentieth century, through two world wars and the Depression. He was the grandson of a gold miner who arrived in Ballarat in the 1850s. His own father, a widower, raised a small army of kids, and Cyril was the first to go to university. He was sent to England during WWI and in the 1920s was employed by the flamboyant and entrepreneurial Fred Walker, charged with the task of creating a substance that would, in time, be named Vegemite. Cyril remained at Kraft until his death in 1949. He was a progressive boss and encouraged further training for all of his staff, many of them women. Cyril was also a husband and father to three children - two were struck down by polio as children, while the third, a fighter pilot, was tragically killed while on a dawn air sortie in the Trobriand Islands, east of PNG during WWII. The author, Cyril's grandson Jamie Callister, says the man behind our national breakfast spread deserves '' to be remembered as a significant and remarkable Australian'' . This is the first book for Callister, a builder and former advertising executive who lives on the Gold Coast. But after reading through a trunk of Cyril's letters and documents he felt it was '' destiny'' to tell the story. Jamie Callister was born in Melbourne, Australia in 1960. After university, he travelled and worked overseas for several years before moving to Queensland. He has since worked in television and media as well as building and construction. A keen surfer, Jamie lives on the Sunshine Coast in Queensland with his wife and three children. This is his first book. Buy Online - Fishpond is Australia's trusted name in online book sales.